Date: 3 March 2015. More Emergency Anchor Up Info. After the article Emergency Anchor Up (OpenCPN info too) was published a fellow soloist gave me a phone call. 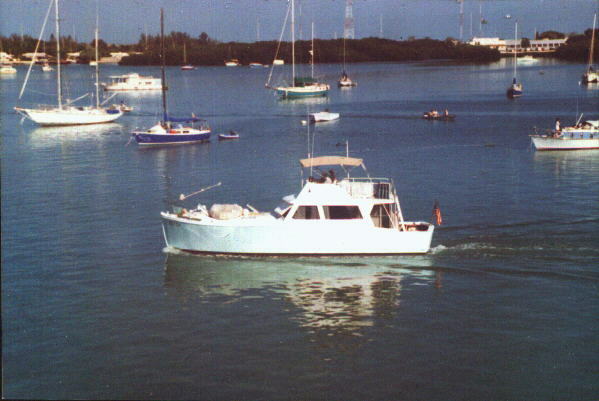 Irene lives aboard her Valiant32 and has like me had to "do the drill" regarding anchor up on more than one occasion. And she's one smart cookie with tricks I've since added to my arsenal. 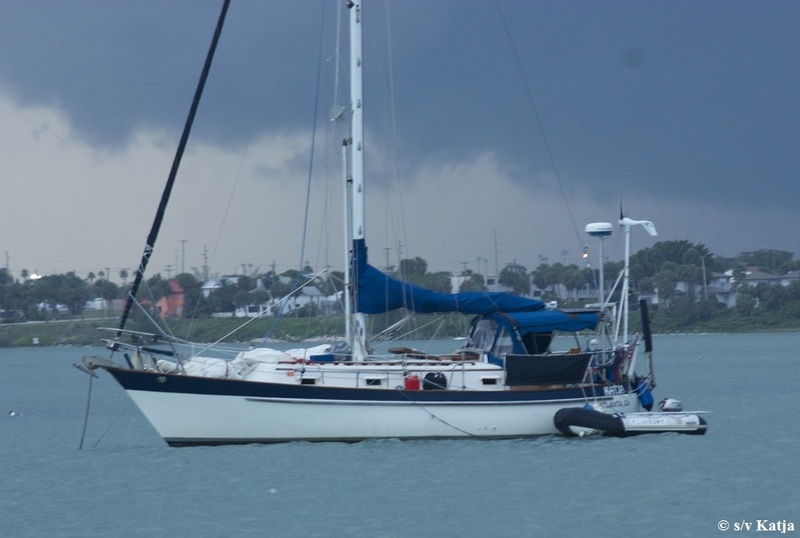 This is Irene's sailboat Katja at anchor in Fort Pierce, FL. Like me, Irene immediately starts the engine on her Katja when an anchoring event occurs. In addition to the normal stuff (as described in the Emergency Anchor Up article) she has a few other things on hand that I'd not considered. A headlamp to light where she's working. 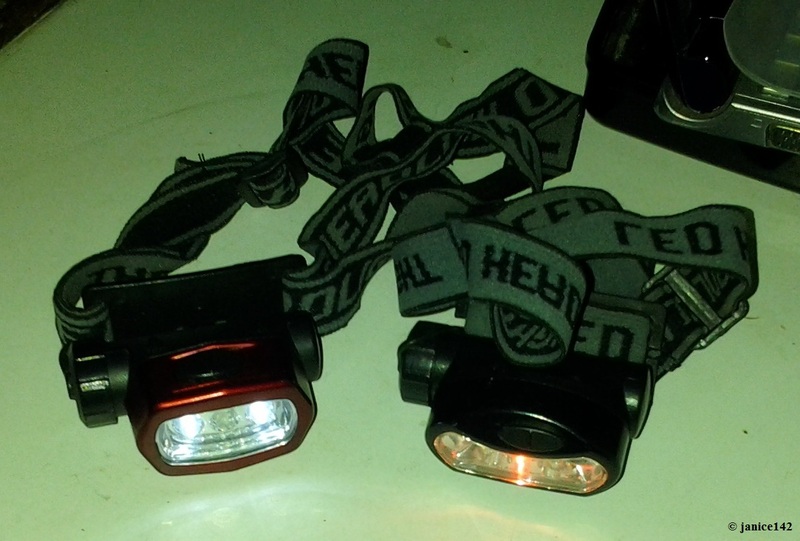 Headlamps are cool gizmos. I have a couple of the units. Mine require one AA battery and have a switch on top. To the right powers two white LEDs and to the left is the center red night-vision LED. Side Note regarding batteries: Aboard Seaweed I've limited all battery powered gizmos to use either AA (preferred) or AAA. It's quite enough to stock two sizes and excluding my smoke alarms (9-volt) the flash lights are all either sized double or triple-A. The head lamps have proven particularly useful in bilges when I've been working on other boats. Ditto when I've been digging in the back of a locker on Seaweed for a particular item. Also, Irene has a second anchor ready to launch on the bow. Part of the danger of dragging is in getting up on that lee shore where the boat can be battered. Also, if in an anchorage with other boats one wants to stay away from them and prevent damage to other vessels along with your own. Being able to immediately launch a second anchor and make the boat stationary is an important safety factor. Another thing Katja has on hand (tied to the forward stanchion and bow rail) are a couple of small pieces of line. Sometimes relieving the stress on the chain is important in helping to either retrieve or set set the second anchor. Having short pieces of rope conveniently nearby helps. especially in an emergency situation. Having a piece of rope to relieve tension on the anchor rode is smart. That same item in a locker in the cockpit does little good when you need it on the foredeck. As a soloist having the luxury of help is not likely. Solving an issue independently is one trait of a successful boater. Like Irene, I intend to keep a piece of string forward. For Seaweed, that will probably mean attached to the remote for my windlass. On our boat (the 40'er) we kept a small hatchet/ax inside the anchor locker. A second was inside by the door into the cockpit. If we needed to part a rope (our rode was 1" three strand, following 40' of heavy chain) the axe would serve the purpose. 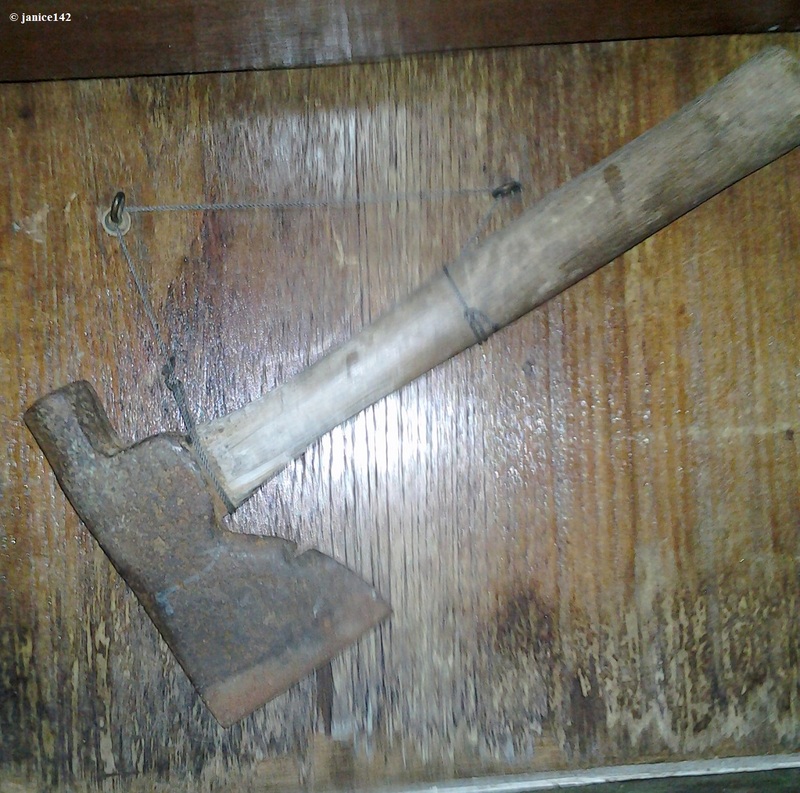 I still have one of the hatchets. It's just beneath the step to exit Seaweed on the starboard side of my pilothouse. I do need to sharpen it because frankly, at this point it's not likely to cut much of anything. It's a boat: there are always things to do. Have you any anchor-up tricks to share? And do you have a way to cut your boat free from entanglements? Aphorism Alert: Today I have been more useless than the "g" in lasagna.